Unique is probably the most overworked word in the whole wine lexicon, but if there is any wine it really fits, that’s Savennières. If you don’t know this Loire rarity, it’s time you made its acquaintance. This is an intriguingly paradoxical wine: both austere and opulent, with a set of aromas and flavors that instantly separate it from all the Chardonnay- and Sauvignon-based white wines you’ve ever tasted. 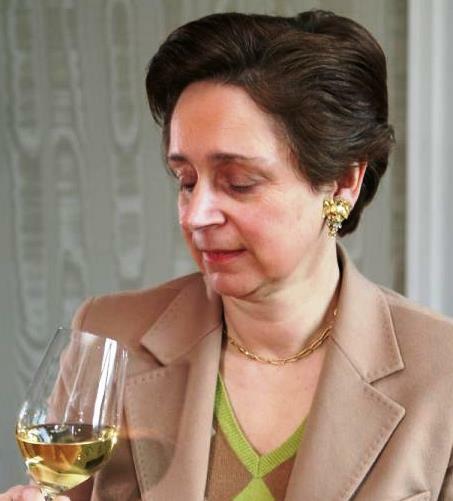 Those flavors grow more intense and more distinctive as it ages, and it is a white wine that can age very long indeed. I had promised Long-Suffering Spouse no wine visits on our Loire vacation, but one of our shore excursions included one. Ironically, we went off to this visit not even expecting it: The description of the morning’s attractions didn’t mention what for us turned out to be one of the highlights of our entire trip, a visit to the Domaine du Closel/Chateau des Vaults, a premier estate in the tiny Savennières appellation. 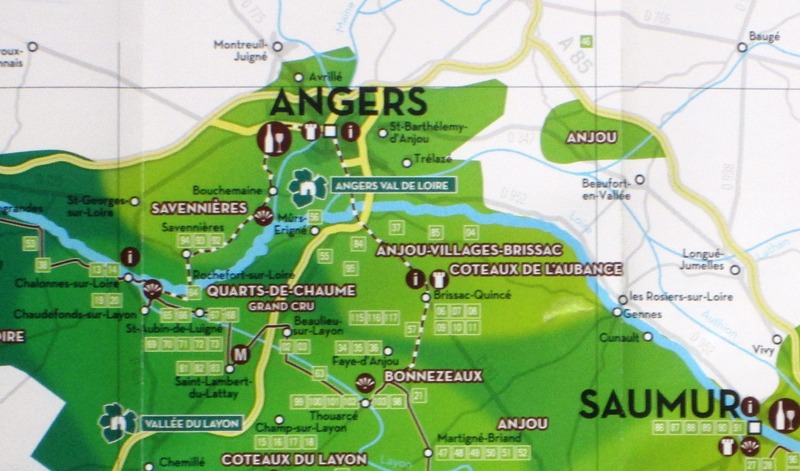 The Savennieres zones lies just southwest of Angers, on the north bank of the Loire – one of the most precarious places in France to grow grapes. Most of the zone is hilly, affording lovely views of the Loire valley from the tops of the vineyards, the best of which lie on south-facing slopes about 100 meters above the river. It’s the soils that give Savennières its character. At Domaine du Closel, for instance, the best sites have a thin layer of topsoil over bedrock of slate and quartz, which forces the vines to send their roots very deep into cracks and runnels seeking nourishment. 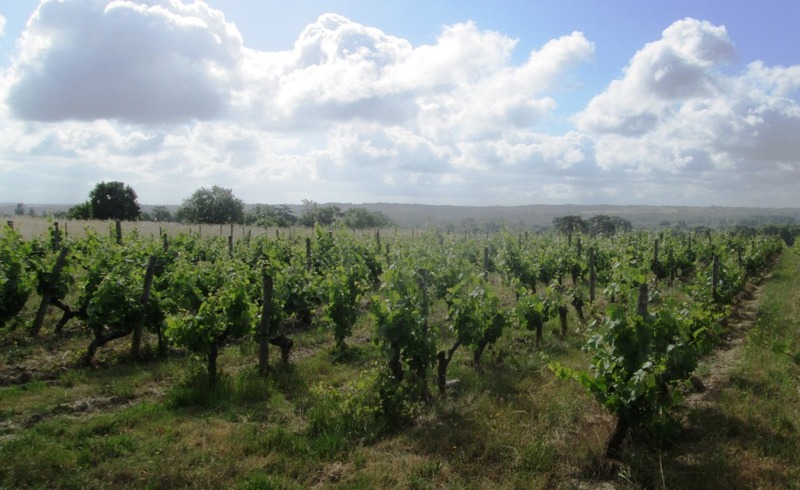 That kind of stress can make great wines, and in Savennières it does so quite often. Evelyne de Pontbriand, the proprietor and winemaker at Domaine du Closel, walked us up the steep slopes to view the vineyards. These immediately adjoin those of Nicolas Joly, for some years now the most famous name in Savennières. It was breezy up there, and the vines grew fairly close to the ground – not more than two-and-a-half to three feet tall, as I recall. A biodynamic grower, Mme. de Pontbriand in her brochure describes her soils in loving detail: “They are shallow, very warm and consist of purple and green schist, purple sandstone enriched with volcanic rocks (quartz, phtanites and organic matter).” I’ve visited many vineyards, and I can vouch that that qualifies as a very complex bed for vines. I should say vine, not vines: In Savennières, there is only one: Chenin blanc. This is not a variety highly regarded in most of the wine world, but on the banks of the Loire – most usually the south bank, I grant you – it yields lovely wines, ranging from dry and charming to sweet and magnificent. Most of those come under the Vouvray appellation. 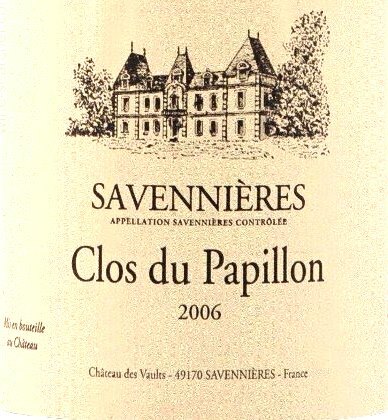 Savennières forms Chenin blanc’s greatest dry expression, a wine of tremendous complexity and great aging potential. I have been lucky enough to drink a few twenty-year-olds that still live in my memory for their vibrancy and depth. La Jalousie 2014, her base wine, a relatively early-harvested (to preserve the fruit and acidity) wine with a greenish-gold hue, dry and light with a touch of elegance. This shows a muted version of Savennières’ distinctive flavor spectrum. It is a drink-every-day wine, with – Mme. de Pontbriand insists – an extraordinary aptitude to marry with asparagus and artichokes, which certainly shows just how different a white wine this is. Les Caillardières 2013, a wine of deeper gold coloration and deeper aromas and flavors. I sniffed pears and baked apples and mineral notes, with similar elements emerging on the palate. Already somewhat complex and elegant, this wine seemed to want a few more years to develop further. We purchased two bottles of the 2006 Clos du Papillon on the spot, and last week opened one to accompany a dinner of turbot in the sauce beurre blanc that the Loire had failed to give us. The wine was so good that I seriously regret not throwing away half our clothes and filling the suitcase with bottles of it. It tasted indefinably spicy on the palate – woodruff and star anise, maybe – with a vigorous herbal/vegetal attack and with minerals present but secondary; a wine totally different from the Chablis one might be tempted to compare it to. It had clay and earth aromas in there too, but not stone, and as it warmed, dry honey came up, even distinctly acacia honey; I think that’s the touch of botrytis speaking. It was a very big wine, but not at all fat: the finish in fact was very long and lean. As I said at the start, Savennières is paradoxically austere and opulent, and this bottle fit that description perfectly. I plan to get more of it, and hope to live long enough to drink it when it matures.